We love making chicken cordon bleu, which is chicken stuffed with ham and cheese, coated with breadcrumbs, then baked until tender, especially when it's that easy version! So why not make it into a main dish salad? We like turning recipes into main dish salads like this pasta cobb salad. 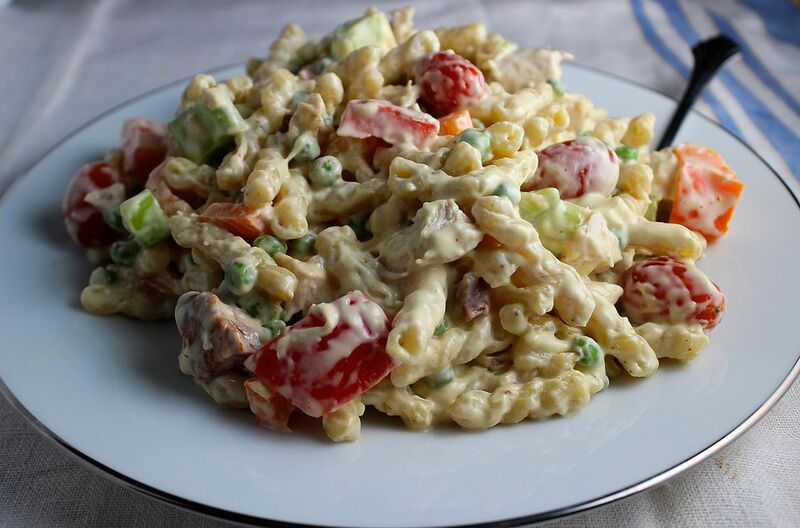 We just combine chicken, ham, cheese, peas, and other veggies in a creamy mustard sauce with some rotini pasta to make this wonderful recipe. It is a delicious and refreshing salad and a nice change from the classic pasta or chicken salads. All you need to serve with this salad is a glass of iced tea and perhaps some breadsticks or muffins. It makes a wonderful dinner on a hot summer night, or a great lunch on the porch. Meanwhile, in a large bowl combine the mayonnaise, yogurt, mustard, vinegar, sugar, and salt and pepper to taste; mix well with a wire whisk. Prepare the meats and all of the vegetables. Cook the pasta until al dente. Drain and add to the dressing in the bowl along with the chicken, ham, cheese, peas, celery, tomatoes, and green onion. Stir gently to mix. Cover and chill for 2 to 3 hours before serving. Store any leftovers, well covered, in the refrigerator up to 3 days.